Mobile slots developer mFortune operates its own mobile casino with a huge portfolio of games available to slots players to download straight to their phones. That’s the good news – the bad is that on a small smartphone you’ll be squinting a lot more in order to see what the hell is going on. One such game is their comedy capers slot for phones, Cat and Mouse. 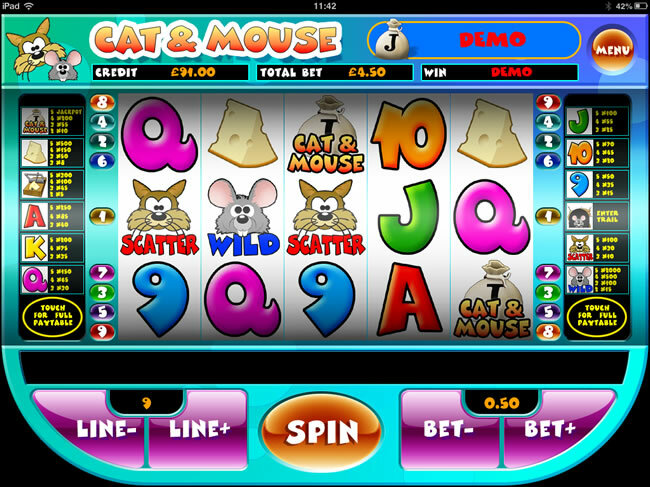 If you’ve played any of mFortune’s other slots for tablets or phones, you’ll recognise the interface – the oversized Spin button dominates proceedings, with half the screen in fact taken up with Lines, Bets and Spin buttons. Having said that, the actual reels – 5 of them here – still look fairly clear despite the lack of space they take up. That’s down in part to the simple graphics on display too: the reels are packed with cartoony graphics to go with the game’s Tom & Jerry vibe: a Lump of Cheese, a Mousetrap, plus some bubble 10-through-Ace symbols. The swag bag pays the jackpot if you hit five across the reels – and that’s a progressive jackpot to boot – which sets this mobile slots apart from some of its contemporaries. The game’s Wild is the Mouse, and it substitutes for all symbols other than the Scatter and Bonus icons. 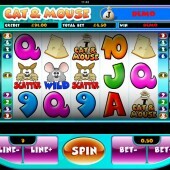 Free spins can be yours if you hit the Cat Scatter across the reels anywhere. Three Scatters gives you 5 free spins; four Scatters bags you 7 free spins, while five Scatters awards the top whack of 9 free spins. Three or more Mouse Hole symbols, meanwhile, triggers the other bonus game, a Trail Bonus game. Roll the dice and make your way along the trail, bagging multipliers on your wins as you go. If the cat catches up with you, however, your turn ends and you’ll be sent scurrying back to the base game. There are 5-9 free spins and a basic Trail Bonus – if you’re familiar with mFortune’s games you’ll recognise the set up here. And if downloading games straight to your mobile phone sounds like a plan, try out some of the developer’s other games. The Millionaire-themed thrills of Monte Carlo or the seafaring antics of PiratesTreasure are great for starters.